Public views of other nationalities are often rooted in stereotypes. These perceived characteristics may or may not be fair or accurate. But they capture a public perception that may help explain national attitudes on a range of other topics. As part of our recent survey of the relationship of Japanese and Americans, we asked the publics in both countries if they associated particular words with people in the other country. To Americans, the Japanese are generally viewed in a positive light: Words like “hardworking,” “inventive” and “honest” are what American use to describe them. 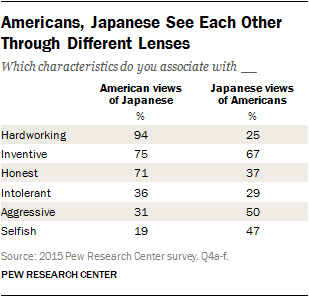 In fact, more than nine-in-ten Americans say they associate “hardworking” with the Japanese. The Japanese offer a more mixed assessment of Americans, however. They see Americans as “inventive” but also “aggressive.” And relatively few think of Americans as hardworking and honest. Two-thirds of Japanese see Americans as “inventive,” with younger Japanese (76%), those ages 18 to 29, more likely to say this than their elders (53%), ages 65 and older. But only 37% of Japanese associate honesty with Americans, and only a quarter voice the view that Americans are hardworking. Older Japanese seem particularly critical of Americans in these regards: Just 20% see Americans as hardworking, and 34% associate them with honesty.